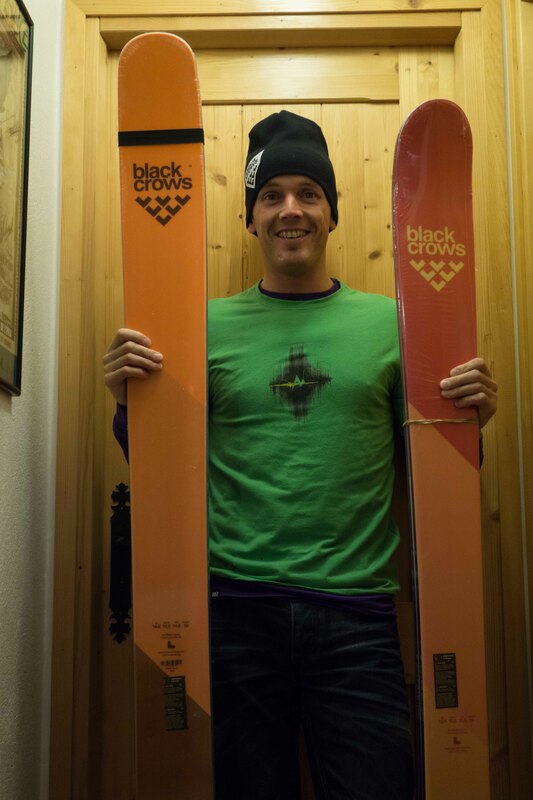 I’ve just arrived home after 4 months away and was really excited to pick up my new quiver of skis from Black Crows’ office in Chamonix yesterday. Black Crows are a local ski brand, taking their name from the friendly alpine Choucas (Black Crow) that you see souring about and playing on the thermals. The legend is they are the souls of dead mountaineers. Always feed the birds when you stop at the col. When one of my friends greedily kept her food to herself she quickly found that one of the birds had made a deposit on her shoulder! I’m psyched to be part of one of the coolest and stylish brands out there. A big thanks to Black Crows and UK importer Mountain Boot Company for the support. This entry was posted in Skiing and tagged Black Crows, Mountain Boot Company by Ross Hewitt - Skiing, Climbing, Photography. Bookmark the permalink. Dang! Those look like they are going to be FUN!